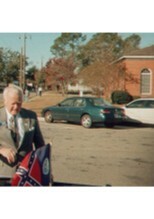 Sen. Don Cheeks, shown here, not afraid to help decorate a bit before the parade. Thanks to help from area SCV camps Ebenezer, Tattnall, Statesboro, Waynesboro, Augusta, our honor guard was very impressive and warmly welcomed by the crowd. Notice the drummer, who kept the crowd alerted to the coming honor guard! Click here for an honor guard photo from the Metter Advertiser. The Dixie Guards SCV float entry was named BEST in the parade! They even gave us a plaque to prove it! The photo below right, shows two portions of our tri-level entry representing the 1860-1880 decades. 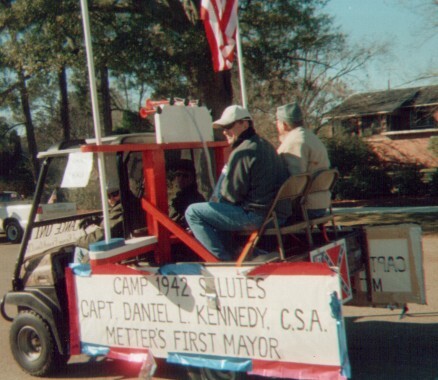 Our "float" featured three parts: a fourwheeler, a marching, firing honor guard and a flatbed drawn by a truck, all honoring Metter's Confederate Founders by name. All in all at least 20 of Metter's early founder's were Confederates, including the first acting Mayor, first elected Mayor, and the first doctor. 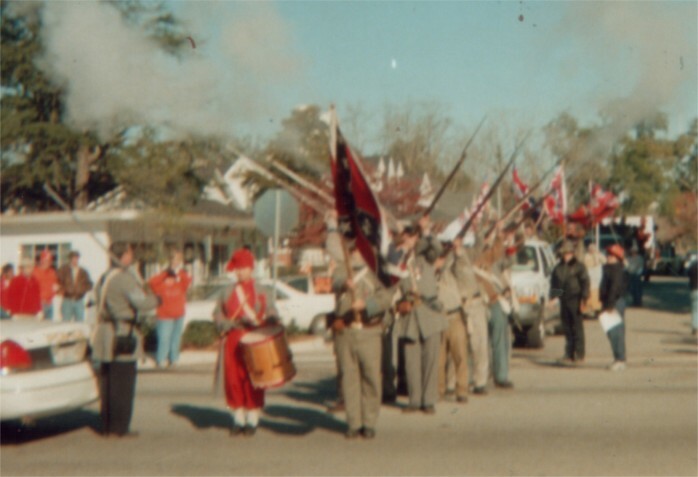 The dramatic firing honor guard depicted Metter's former Confederate Soldiers followed by the truck and flatbed with cannon which listed the names of all of Metter's known Confederate founders and settlers. Our lead vehicle which preceded the marching and firing honor guard featured a salute to Metter's first elected Mayor, Capt.Dan Kennedy. This photo was taken after the parade route was finished. The gusty winds had taken a toll on the red and blue "bunting" by then, but when we came by the judges platform, everything was ship shape. And yes, the horn DID play Dixie! See photo from Metter Advertiser here. 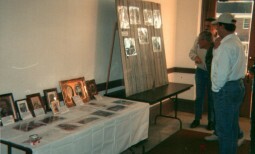 And our exhibit of historical photos and artifacts of Metter's Confederate founders in the courthouse drew lots of compliments. Thanks to member Ted E. Lewis for his help on this project.